Get up to $888 Free in Bonus on your first deposit! 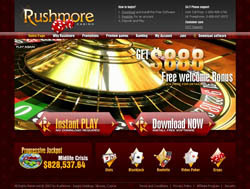 Rushmore Casino is owned by Rushpod Investments NV and has been in business since 2001. The casino uses Real Time Gaming software and offers more than 70 classic slot machines and table games. Rushmore Casino is one of the few online casinos which accept US players and feature a huge deposit bonus for new players in addition to special promotions aimed at high rollers and slots players. The casino is licensed through the Rushpod Investments NV Curacao, Netherlands Antilles with audits performed by a third party company named TST, otherwise known as Technical Systems Testing. Rushmore Casino offers some of the largest casino bonuses online in addition to game specific bonuses. New players will receive up to $888 free once you make your first deposit. This bonus is broken into two parts with your first deposit awarding you a $488 bonus and your second deposit earning an additional $400. Once you have cleared these bonuses you can begin to claim daily and weekly promotions which are made available in the casino cashier. All of the bonuses offered to players at Rushmore have rollover requirements first before you are able to request a withdrawal. For more information on the regular promotions or how to clear your bonus you can visit our Rushmore Casino bonus page for details. Each of the slots and casino games offered at Rushmore Casino were created and supported by the Real Time Gaming network. There are more than 30 online casinos using this network which means that the progressive jackpots grow quickly and provide huge payouts. 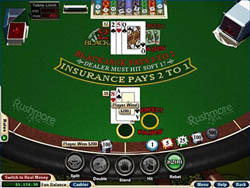 The casino is available for Mac and Windows players supporting an instant flash client on the casino website in addition to a full software package. If you want access to all of the games in the current line-up we suggest you download the full software package if you are able to as the instant play version is quite limited to the number of games available. Players can also access the casino using their mobile. Rushmore Casino is available for real money players as well as offers free slots games and card games. 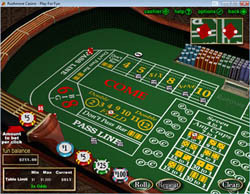 Each game presents a new theme and or bonus round and although the graphics are not as dynamic as some of the newer casinos, they won�t lag your computer either. RushmoreCasino provides a wide range of slot machines starting with the classic 3 reel slots to the multi-payline progressive machines. In total there are over 50 available games to choose from and each slot has been designed with unique graphics and features. The most popular games are of course the progressive jackpots, which are played system wide and offer high paying prize pools. These games include �Mid-Life Crisis�, �It�s Good To Be Bad� and I.R.I.S.3000. In addition to the regular progressives, Rushmore Casino�s slots provide a random progressive which means you will not need a winning combination in order to land a payday. These games are won based on any combination and typically provide jackpots ranging from $3,000 - $10,000. The casino does support free slot games, however if you choose to play for real money bets will start at one penny up to $5 per line, per spin. The maximum bet that can be made on a machine is $100 by playing the 5 reel, 20 pay line machines. The table and card game selection is limited to the standard game selection. You will find Blackjack, Caribbean Stud Poker, and Pai Gow among others with the table games listed under the specialty category. Each game supports high quality graphics with side view windows for games like Roulette and Baccarat. This allows you to see the results of the wheel or dice. Rushmore�s tables accept wagers as low as $1 up to $1000 in a single game of Craps. A detailed guide on how to play each table game is provided for new players in addition to payout charts displayed on the tables. Support is available around the clock with Rushmore offering email, live chat and toll free numbers for phone support on their website. The live chat should respond within a few minutes however if you do need to use the phone numbers you will need to check the RushmoreCasino.com website for the toll free number based in your country. The casino provides multiple payment options for their players including those that accept US payments. All withdrawals will be processed within 48 hours of the initial request, with payments credited back to the original method used. The current list of deposit options for Rushmore Casino include; Visa, MasterCard, Visa Debit, PrimaPin, UseMyWallet, Quick Tender, Click2Pay, eWalletXpress, Neteller, MoneyBookers, InstaDebit, Wire Transfer, and Eco Card.